Heartwarming movies are always a plus for me. Add to this a documentary with good end of life themes and I'm snagged. Young@Heart (2007) is just this. It is a documentary about a singing group in Massachusetts who covers such artists as Coldplay, Sonic Youth and James Brown. The twist is that the average age of the members in the group is 81. The movie follows the group of 24 for 6 weeks through a series of rehearsals and performances. Intermixed through the rigors of learning new songs like "Schizophrenia" by Sonic Youth, are laughable moments and trials from the health issues of chorus members. The lessons in the film are abundant, and most center on how to make "living" more worthwhile. 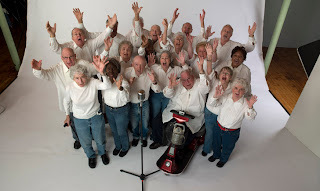 The singers have a sense of purpose with the group, they feel their minds are sharper as they learn and memorize songs and the necessity of being with other people during the day helps them live longer, more quality lives. The most poignant moment for me was the night of the concert. One of the members had died, and the soloist himself is in poor health. His oxygen hisses in bursts as he sings Coldplay's "Fix you". The lyrics, which were written portraying the emotions of the death of someone dear, strike a different feeling sung by a group so familiar with death and so close to death. The chorus member sings, "And the tears come streaming down your face/When you lose something you can't replace/When you love someone but it goes to waste/Could it be worse?" I especially like the realness of this film. Aging is not hidden, the real battles of poor health, memory loss and death are present, however life is celebrated at all times. When I think of palliative medicine being about living life to its fullest, this movie represents that to a tee. Following is the trailer of the film from YouTube, if the link doesn't appear as a subscriber, head to the original post to see. Also follow this link directly to Youtube to see the performance of "Fix You" I spoke of earlier. Loved this movie! It was excellent to see real people, very much engaged in living in the face of limited years. As they experienced deaths within their own group, they drew together to honor their friends and to still bring joy to others. My teenagers even thought this was a great movie! Amy, This u-tube version gave me goosebumps. I liked Coldplay before, but they really stand out now. Thanks for sharing. Now I have to see this movie.